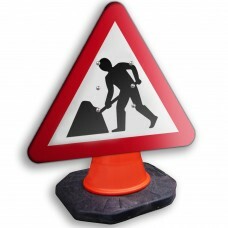 Roadworks Ahead Cone Sign 750mm. Class I reflective face and fully comply with BS8442. Manufactured from durable 3mm polypropylene. Unique sleeve on the rear, which not only gives it a perfect fit to a traffic cone, but it is easy to store and transport.